How did you get started in drawing and illustrating? Drawing and painting have always been my favorite hobbies for as long as I can remember. As for illustration, this will sound funny, I was intrigued by illustration after I studied it as my major in college. During my senior year at high school, everyone was preparing for their college applications. Honestly, I had no idea where I wanted to go or what major I would like to apply. My grades were good but I didn’t know what I wanted as a profession. It was Mr. Levi, my photography teacher, sat down with me and asked me if I would be interested in going to an art school. I had never thought about making my hobby as my profession, plus I had zero knowledge about art school. Mr. Levi handed me a Ryman Arts application, it’s a full scholarship art program teaches teens essential art skills. I was so lucky to get accepted by Ryman Arts and was able to build my portfolio within a few months. With the guidance of Mr. Levi and faculties at Ryman Arts, I got accepted by Otis College of Art and Design, where I majored in Communication Arts–Illustration. I hoped to become a professional illustrator as I learned more about this field. As a fashion illustrator, what is it about fashion and beauty that fascinates you so much? Fashion is timeless, it never gets old! The intricate craftsmanship, ingenious designs, ever-changing trends from fashion labels never fail to impress and inspire me. Runway looks by these brilliant designers will always be a very important source for my inspiration. I try to observe and discover beauties in everything around me. Beauty just make every ordinary thing extraordinary. I wish to find a way to capture and preserve the beauties that I see and recreate them in someway. You‘ve already been commissioned by Vogue, Macy’s, Versace and the like. 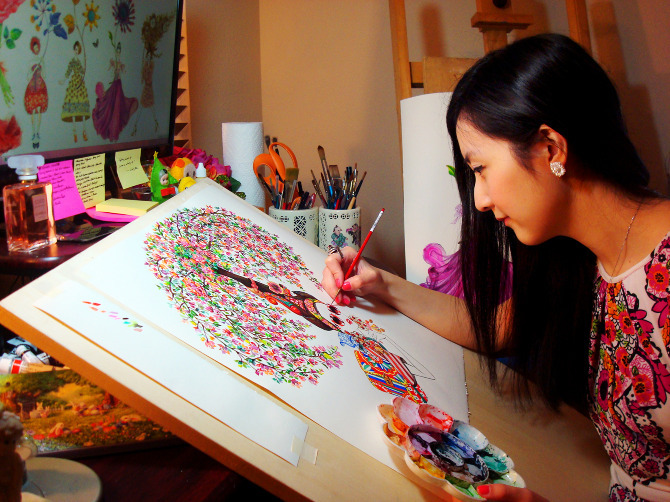 Has it always been your dream to become an artist and make a living off of it? Yes, it’s always been my dream profession & lifestyle! Your illustrations are filled with joy, created by rich details and vibrant colors. Where do you find all the positivity you show in your art? What inspires you? Are there any illustrators or artists in general you look up to? There are so many! I especially love Gustav Klimt’s use of pattern and composition, Van Gogh’s color palette, Claude Monet’s dreamy brush strokes. I admire the masters of fashion illustration, René Gruau, Bil Donovan, David Downton to name a few. Many artists struggle to find their own unique style. What helped you to develop your style? I was struggling with the term “style” when I first started, one message from Bil Donovan has changed my perspective about “style” forever. When I was still studying in College, I e-mailed the master of fashion illustration, Bil Donovan, for advice. He kindly responded and wrote me an insightful one page reply! I still read it every once in awhile, it has became my “fashion illustration mini bible”! He told me, “Don’t try to find your style…It will find you…” I did what he said, and I think it worked! Do you have any tips for aspiring illustrators in general? Don’t wait for opportunity to come knocking on your door, create your own opportunities. I greatly appreciate your kind words and helping me sharing my work.